The health benefits of pomegranate juice have become more widely studied and known in recent years, and it’s a good thing! Pomegranates and their juice have a wide range of positive health effects, and more and more people are taking advantage of this by adding this fruit to their regular diet. According to an Israeli study in the June 2004 issue of Clinical Nutrition, one glass of pomegranate juice a day can reduce your blood pressure by up to 5%. It also will slow down the oxidation of LDL cholesterol (the ‘bad’ cholesterol) and raise HDL cholesterol (the ‘good’ cholesterol). Pomegranate juice is said to help keep plaque from building up in your arteries. And if you already have arterial plaque, apparentlypomegranate juice can help clear and reduce the buildup. In one study, mice who were bread specifically to develop Alzheimer’s were given regular doses of pomegranate juice. The study reported that mice had much less amyloid plaque in their brains than mice who were not treated with the juice, and they also performed better at mental tasks. In mice studies, pomegranate juice is reported to have slowed down the development of prostate cancer. And in a study of 50 men who had received treatment for prostate cancer, one glass of pomegranate juice a day kept their prostate-specific antigen levels stable. The study discovered that this reduced their requirement for any more chemotherapy or hormone therapy. Several studies done in Israel have found that pomegranate juice prevents breast cancer cells from forming. Additionally, and perhaps more importantly the studies found that the juice helped target and destroy breast cancer cells, while it avoided healthy breast cells and left them alone. Other health benefits of pomegranate juice include a high level of antioxidants…in fact, more than red wine, green tea and most other fruit juices. There have been positive effects noted for the prevention of osteoarthritis and tooth decay as well! 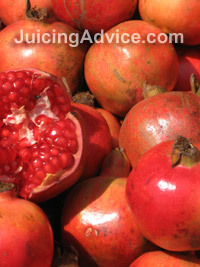 So if you’re looking for a tasty beverage that improves your overall health, you can’t go wrong with pomegranate juice. Learn more about the advantages of juicing other fruits.